The Board of automobile component firm Hinduja Foundries Ltd has given its nod for amalgamating the company with heavy commercial vehicle maker Ashok Leyland subject to regulatory and shareholders approval of both the companies. “At the meeting held today, the Board of Directors of the company unanimously approved the proposal of amalgamating Hinduja Foundries Ltd, a Hinduja Group company with Ashok Leyland subject to various regulatory and shareholders approval of both the companies,” a company statement said. The Board also approved the exchange ratio on the amalgamation in which one hundred equity shares of Rs. 10 each of Hinduja Foundries Ltd will get 40 shares at Rs. 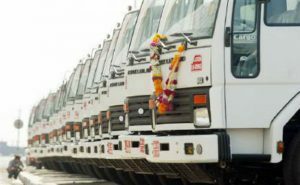 one each fully paid of Ashok Leyland Ltd.
“One Thousand 2008 series GDRs of Hinduja Foundries Ltd will get 133 equity shares of Rs.one each fully paid of Ashok Leyland,” it said. “One 2016 series GDRs of Hinduja Foundries Ltd will get 4,800 equity shares of Rs. one each fully paid of Ashok Leyland Ltd,” it said. The proposed date of amalgamation is October 1, 2016. “We welcome Hinduja Foundries into the fold of Ashok Leyland Ltd. The amalgamation will result in operational efficiencies and help realise significant cost synergies,” Hinduja Group company and heavy commercial vehicle maker, Ashok Leyland Ltd., Chief Executive Officer and Managing Director, Vinod K Dasari said. “We are confident that the roll out of the best practices of Ashok Leyland will benefit Hinduja Foundries Ltd. While it is a critical supplier to Ashok Leyland Ltd, it will continue its focus to grow its relationships with other customers,” he said. “In fact the new arrangement will help in providing a wider range of solutions to them. There is so much more Hinduja Foundries can do under the new arrangement,” Dasari said in the statement.